Note	 not for use with wood or petroleum fires. About 2 years ago, I made the switch to an alcohol stove – for several reasons: 1) wanted to reduce my base weight; 2) tired of gas canisters; 3) my old canister stove was in need of replacement; 4) I saw other backpackers having good experiences with their alcohol stoves; 5) wanted to go a little “greener” (what happens to all those empty gas canisters, anyway?). So I did a bit more research and went with the Caldera Cone. I consider it one of my best gear purchases ever. I’ve used this stove exclusively since I got it. That includes almost 100 nights on the trail or in the back country, in varying terrain and weather conditions. I pair it with my cooking pot, an MSR Titan Kettle. The plastic caddy screws apart and yields 2 pieces: the smaller upper portion that can be used as a cup and the larger lower portion that can be used as a quasi-bowl. I do use the smaller caddy piece as my coffee cup; I’ve never used the lower caddy piece as a bowl. Note the little bonus there: you can ditch the cup you were carrying and use the upper caddy instead. Genius, right there. It’s lightweight. The 12-10 stove, cone windscreen, measuring cup and fuel bottle nest inside the caddy. When weighed all together, it’s 4.5 ozs. It’s easy to use. First, assemble the cone windscreen by sliding one dovetail into the other. Measure and pour your fuel into the stove. Light the fuel and place the windscreen around the stove, and then place your pot inside the top of the windscreen, where it fits snuggly. I usually put the lid on my kettle to help the water boil faster. In about 6 to 7 minutes (on average), 2 cups of water reaches a full boil. I know from using this stove exactly how much fuel is needed to achieve a full boil (exact amount, right down to the milliliter). This is useful because it eliminates wasted fuel, and you can plan to carry precisely the amount of fuel you’ll need for any trip. No more messing around with gas canisters, wondering how much fuel is actually inside and invariably carrying an extra canister “just to be safe.” I use the 5.5 oz bottle that comes with the stove, and supplement it with another plastic bottle of the same size, or a bit larger if I’m going to be out for longer. Again, I know how many meals any trip will entail and can plan to bring the exact amount of fuel I’ll need. There is no “fiddle factor” with this stove. No moving parts. Nothing that can rust, corrode, or wear out. It is about as simple as a stove can be. It’s sturdy. No need to worry about the pot being accidently toppled over, or balancing a pot on the 3 prongs of a typical canister stove. It’s efficient. The cone windscreen has ventilation slots on the bottom for good air flow. 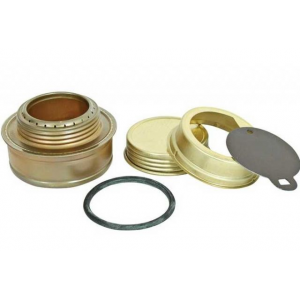 The snug fit of the pot into the cone creates an ideal heating environment that maximizes every BTU generated. I’m a simple man when it comes to backpacking cooking. I only cook meals that require boiling water. I’ll usually use a combination of pre-packaged Mountain House meals and very simple freezer bag meals of my own doing. I don’t need a simmer function with my stove – I just boil water and add it to my meal. For breakfast, it’s usually some oatmeal and coffee. Simple. I don’t miss my old canister stove one bit and am very happy with the Caldera Cone. Thanks for sharing your review, Earth Pig! I've always been curious about this stove Earth Pig. I'm a "simple cooker" too. Old saying in the Army: "Simple is hard enough." Earth Pig great review>I've been wondering about the Caldrone cone and its benefits. Hello - Gas Cannisters can now be recycled. To speak to your point in your review. Google the string "Jetboil Crunchit Fuel Canister Recycling Tool". Puncture the gas canister and it will be accepted for recycling. Paul, I wonder how many folks know that. I'd never heard of it when I was a gas canister consumer. Explore the Trail Designs Ti-Tri--then you'll have wood, alcohol, or Esbit as options! I have the "SIDEWINDER" ti cone with the Inferno woodturning insert. I can use alcohol, ESBIT (preferred) or wood. I like this flexibility, especially for using wood in the winter. Melting snow takes a lot of fuel so why not get it at the campsite instead of carrying it? And yes, this system is THE most efficient ESBIT or wood burning system available. Its optional Inferno insert for a "gassifier" stove is much more efficient than the Canadian Bush Buddy B/C the pot sits down in the cone and its sides are heated with very little lost heat. You cannot beat this for performance. Only a Trangia offers greater stability. Its simplicity is genius. Harder to operate in the cold. I have many alcohol stoves but this beats them all, though not hands down. 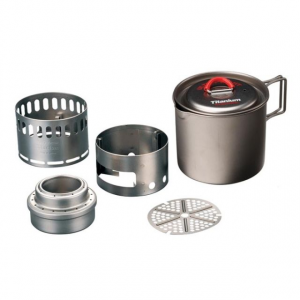 Foremost, it out performs a Trangia for a fraction of the weight and for much less cost. Its simplicity in design and use mean it is extremely well suited to extended trips in more remote areas. No moving parts and its simple design mean there is very little to go wrong. It is an extremely stable system that eliminates the need for a pot stand as the cone acts as both wind shield and pot support. This is where the cone comes into its own. It operates well in all but the windiest of conditions and it is a fraction of the weight. At $34.95 it costs a great deal less too. 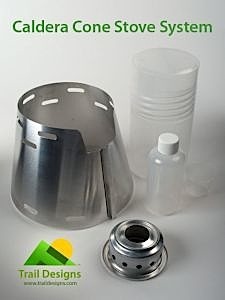 The cone completely encloses the pot being used (Trail Designs manufacture a cone to fit just about every pot out there) so the heat generated by the alcohol stove is not wasted unlike most other alcohol stands available. Instead, heat is channelled and reflected back towards the side of the pot. 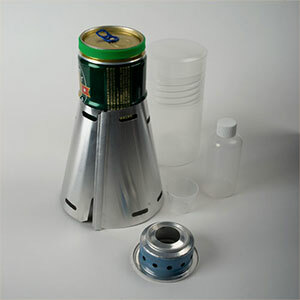 This makes the Caldera Cone much more efficient than other alcohol based systems meaning less fuel needs to be carried. It is incredibly easy to set up and this is well worth taking into account. Elaborate systems are so much harder to figure out when it is cold and or dark and the user is exhausted. Simply slot the cone together, slot the pot into place at the top and place over the alcohol burner. Wait 4-6 minutes for a rolling boil using next to no fuel. There is no need to wait for the burner to bloom. In fact, placing the cone and pot over it will speed this process up. As I said it does not beat the competition hands down. It needs to be stored carefully when not in use as the aluminium is much thinner than a Trangia system and is prone to fatigue with constant use. The storage canister adds weight and, more crucially, valuable space in a rucksack. This is not a big ussue as the container can also store a few odds and ends. I do not recommend using the supplied carry case as a cup and bowl (as suggested by Trail Designs). 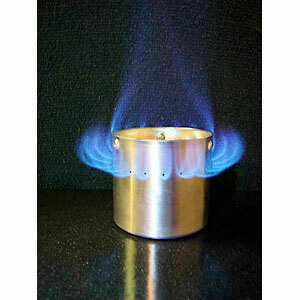 Being an alcohol burner it will not perform as well in low temperatures and or high altitudes. It will be harder to prime and cold fuel dos not take a spark well so more thought will be needed compared to a canister with a 4 season gas cartridge, for example. My only major criticism is that the MSR Titan pot I use slips occasionally as it no longer sits neatly in the top as the diameter of the cone is very slightly too wide. I cannot explain this as it did not happen when I first got the cone. Perhaps the metal is expanding through being heated? The first time it happened I lost a pot of boiling water and narrowly escaped a serious burn. I am now much more mindful of this when using it. Additionally, the cone will only work with the pot it is designed to fit so cooking is limited to that pot which means it is not the most versatile cooking system. 'Ultralites' may find the bulky storage canister annoying but it can be stored flat (just mind the sharp edges, if it is anywhere near a hydration bladder it will slice holes in it). Look after it and it will certainly look after you. I would recommend this product for anyone looking for an efficient easy to use alcohol based cooking system whether it is for a weekend or a long distance journey over several months. It is primarily suited to boiling water for drinks and dehydrated meals. It is possible to cook other meals but other systems will do this better. It is well worth the asking price. Nice review, Oliver! Thanks for taking the time to share it. If you have some pictures of your stove setup, those would be helpful to see in your review too. Oliver, I'd like to see some pics of the set up. I own a Trangia, but have yet to find a set up I prefer over my DIY "Perfect Stove" and windscreen. 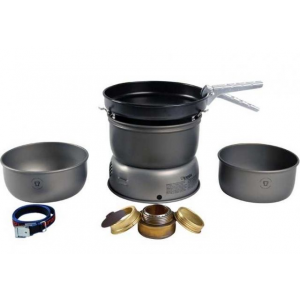 The most efficient, lightweight, simple stove option out there. Though, there is a slight learning curve, and keep it out of the wind. I've been doing more solo backpacking so I needed a lighter weight stove option. After significant research I decided on the Caldera Cone. It is the lightest, most efficient option out there, as long as you are just needing to boil water. The pot stand/wind screen/heat concentrator fits my solo titanium pot perfectly. However, keep in mind it is sized to a specific pot or cup so you need to know exactly which pot you have in order to purchase the right one. It took a couple of uses for me to feel proficient at adding the right amount of alcohol each time, not too much and not too little, and to consistently light it correctly each time even in windy conditions (I've used my Crazy Creek chair as an added wind screen when it's been extra windy). I really like the fact that alcohol stoves have no moving parts so there is nothing to go wrong as long as you don't ever crush the stove. However, the super simple design also means there are limits to what it can do. You won't be using this stove to cook eggs and bacon; it is a water boiler. They do sell a simmering ring but I've never used it b/c I am only interested in using this stove for its strengths: boiling water efficiently. In calm conditions I can usually boil enough water for a solo dinner with only 15-20 ml of alcohol. I've never timed it, but I estimate it takes maybe 5 minutes to bring my water to a boil. Add more time and alcohol if it's windy. I am very happy that I found the Caldera Cone for solo backpacking and like it so much I have considered buying another to fit our larger water pot so I can use one when backpacking with my wife. Great design and very happy with my purchase. Welcome to Trailspace, Tgrabs! Thanks for reviewing your Caldera Cone. Good call on the Crazy Creek chair for the windstopper. In the pic, does the small reservoir hold the fuel and the larger part just act as the shield? If so, doesn't it keep out a lot of wind? Yes, the "cone" part of the Caldera Cone does double duty in that it acts as pot stand AND wind shield, which is brilliant by the way from a weight efficiency standpoint, however an alcohol flame is fairly passive, and cool, compared to pressurized petroleum-based fuels, so a little bit of breeze can get in the lower air holes of the cone and drop the heating efficiency somewhat. No big deal however, you just need to be more aware of your cooking location and use natural or man-made wind blocks (like a Crazy Creek) to your advantage. Look for the model that allows the windscreen to be used with a wood fire. Burn wood in the aluminum model and the sides will melt. With some practice you can gauge how much fuel you need to prepare your meal. Then just light it, do other tasks. When the flame is out your food is ready. For week+ outings your fuel weight will be substantial. A lightweight gas stove and fuel will be less weight and more convenient. On a 10-day hike I found the titanium Snow Peak stove with a canister weighs less than 10 days worth of alcohol. 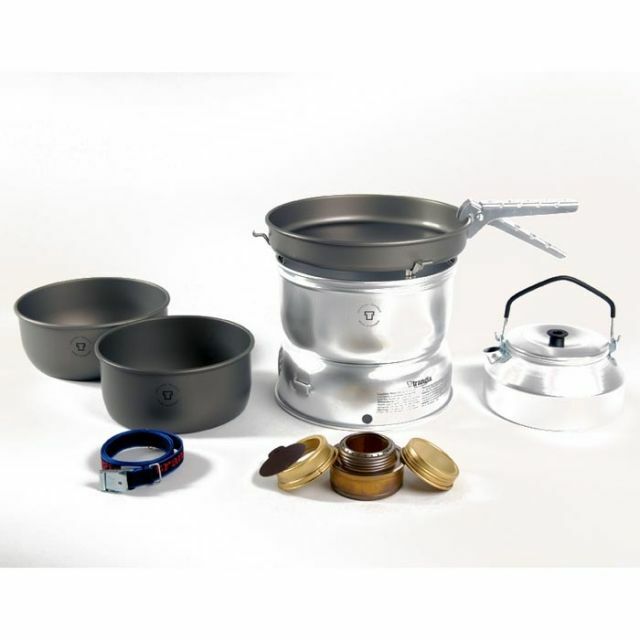 I have used esbit, alcohol, and wood, but the most convenient and easiest to get going is the canister stove. As far as alcohol stoves go (I have a least a dozen homemade jobs) the Caldera Stove system works very well, just be sure to get the right size for your pot. The Trail Designs Caldera Cone System is not available from the stores we monitor. It was last seen December 25, 2015	at CampSaver.com.